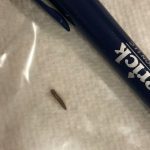 One of our readers recently wrote us, “I have found tiny looking worms on my sofa, bed, and carpet, and I believe something is in our clothes that is making us itch. PLEASE HELP US IF YOU CAN!” While the message isn’t particularly detailed, we can tell by the capital letters in her plea for help that she is desperate for answers and assistance. She didn’t send a photo of the “tiny looking worms,” but we still have a hunch that we know what these creatures are. 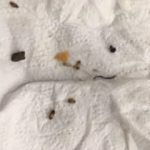 It sounds like our reader is dealing with a carpet beetle larvae infestation. Even without a photograph or a detailed description, we are confident that these are the creatures hiding in her sofa, bed, clothing, and carpet. Carpet beetle larvae are extremley common household pests. They have a wide range of potential food sources including bedding, upholstered furniture, carpeting, wool, feathers, felt, leather, linens, pet food, animal hair, and other various materials found throughout a home. 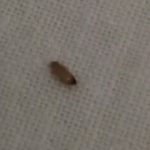 Getting rid of carpet beetle larvae entails finding and removing all infested food sources and sticking to a strict cleaning regime until all signs of carpet beetle larvae are gone. 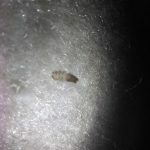 It sounds like the carpet beetle larvae may have spread to several areas of our reader’s home if she has noticed them on her couch, bed, and clothing. 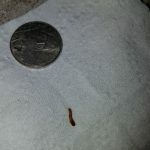 Our reader will need to investigate all of these areas and remove all items that show any disturbance by these “tiny looking worms.” She will probably need to wash all of her clothes and bedding, and she might need to remove her couch and mattress from her home to be professionally cleaned if they are also serving as a home to these larvae. Having her carpets professionally cleaned might also be a step she chooses to take in order to get rid of these larvae. Cleaning is the biggest part and most crucial step of getting rid of carpet beetle larvae. 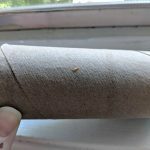 Our reader will need to dust, vacuum, sweep, and do laundry every day until she is confident that her home is free of carpet beetle larvae, eggs, and potential food sources. Now, to note on the itchiness that our reader mentioned. 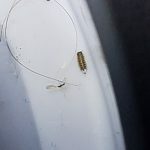 While carpet beetle larvae aren’t considered to be dangerous or harmful to humans, they do sometimes cause an allergic reaction when someone comes in contact with the tiny bristle-like hairs that cover carpet beetle larvae. If our reader is worried she might be experiencing a reaction or is concerned about her health, then we encourage her to see a doctor since we cannot legally provide medical advice. To conclude, we believe that one of our readers is dealing with a carpet beetle larvae infestation. Although these larvae aren’t dangerous, they can be quite annoying to get rid of since eliminating them requires intense dedication to a daily cleaning regime. Some readers choose to hire professional help to assist with handling an infestation. We wish our reader the best of luck! 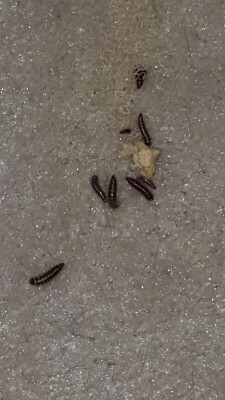 We believe that one of our readers is dealing with a carpet beetle larvae infestation. Although these larvae aren't dangerous, they can be quite annoying to get rid of since eliminating them requires intense dedication to a daily cleaning regime.